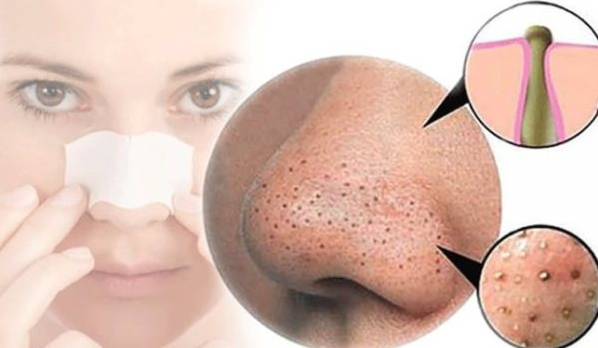 Blackheads, those tiny black dots that usually appear on your nose and cheeks, can be a nuisance - especially for those with oily or combination skin types. Believe it or not, blackheads are simply clogged pores that have been exposed to air. As oil becomes trapped within the pore, it's prone to air exposure, turning the trapped oil at the base of the pore black. Cleanse: Use a water-soluble skin cleanser, preferably in gel form twice daily. Cleansing skin daily helps to remove oil build-up and sustains healthy skin. Tone: Toners are too often skipped due to confusion with astringents. Toners are alcohol-free and do not contain the usual irritants found in astringents. Toning helps remove the last traces of makeup and dirt that your cleanser may have left behind and should be applied directly after cleansing skin. Exfoliate: Exfoliation is the key to minimizing blackheads - a step that should never be skipped. Exfoliants such as beta hydroxy acids (BHAs) penetrate and exfoliate within the pore lining, going through the thickened oil inside the pore. No other exfoliant, including alpha hydroxyl acids (AHAs) or topical scrubs can do this. Use a 1 to 2% BHA exfoliate twice a week until your skin becomes acquainted with the product. After that, apply every other day - careful to avoid contact with the eye area. Oil Absorption: Use oil blotting sheets throughout the day to absorb excess oil. In the evening, using a clay mask designed for oily skin will help minimize shine and control excessive oil production. If your blackheads are stubborn, don't hesitate to see your favorite dermatologist about prescription options such as retinoids. Your dermatologist can also extract the blackheads for you. However, if you're savvy with a comedone extractor, you can remove them yourself. Further, to minimize oil and the formation of blackheads, try a light-weight, liquid moisturizer with a combination of oil-controlling ingredients such as tea tree oil, vitamin C, and vitamin B3 (niacinamide). The moisturizer you choose should reduce the amount of oil produced within the pore, calm irritation, and minimize the formation of blackheads.